In recent years, an increasing number of adults have found themselves looking for an orthodontic solution that allows them to achieve a straighter smile without marring their professional image or taking up all of their free time. 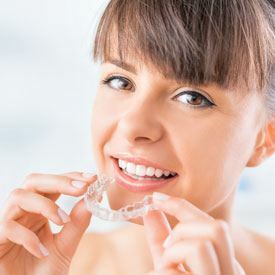 For both adults and teens, Invisalign may be a viable alternative to traditional bracket and wire braces orthodontics. Thanks to continued innovations in the Invisalign process, more alignment issues than ever before can be treated without metal braces. That includes over, under, and crossbite. If you’d like to find out more about Invisalign, contact our team to schedule a cosmetic dentistry consultation. We’ll examine your smile, and help you make the best decision to achieve your orthodontic goals. Traditional braces use pressure on brackets attached to the front surfaces of teeth to move them into their ideal alignment. Invisalign relies on a series of clear plastic aligners to move teeth. Each set of clear aligners represents what the smile will look like one step closer to the desired result. Over the course of about ten days of wear, teeth shift into this new position, and patients will exchange the current aligners for the next set in the series. Every six weeks to two months, you’ll visit our team for a short checkup. During these visits, we’ll make sure your smile is correcting itself according to our treatment plan. We can adjust the plan during these visits to ensure your smile correction stays on track. If you ever damage or lose your current set of aligners, replace the previous set and call our team to schedule an appointment. Your Invisalign orthodontic plan will vary in price based on a number of factors, including the number of aligners needed, length of treatment time, and need for more advanced treatment for issues like over, under, and crossbite. Many patients are under two false assumptions about the cost of Invisalign treatment. The first is that it’s significantly more expensive than traditional braces. This is just not the case. In fact, most patients end up spending about the same amount regardless of whether they use traditional bracket and wire braces or clear aligners. The second incorrect assumption many patients make is that their dental insurance won’t cover Invisalign treatment. Today, the majority of dental insurance providers offer the same coverage for traditional braces and clear aligners. We will be happy to help you explore the costs of your Invisalign plan to ensure the costs of treatment fit into your budget.